The condominium market is holding up the sales fort, with South Boston leading the pack with 78 units sold from the period covering June 1 to June 20. Attributed to the fast-rising number of developments being turned over in this by the shore neighborhood, the Innovation District as well as Fort Point are the districts that mainly contribute to the sales figure. 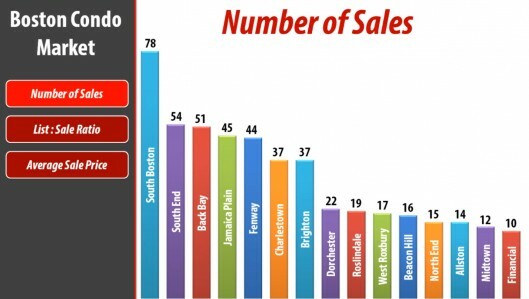 Not surprisingly, the South End and Back Bay place 2nd and 3rd, with 54 and 51 sales, respectively. Jamaica Plan and Fenway round up the Top 5, with only a sale difference between the two, clocking in at 45 and 44 units sold. Note: This is a mix of newly-turned over and existing condominiums in all areas. In terms of average sale price, condominium properties in the Midtown lead the list, with an average price tag of $1,368,708. 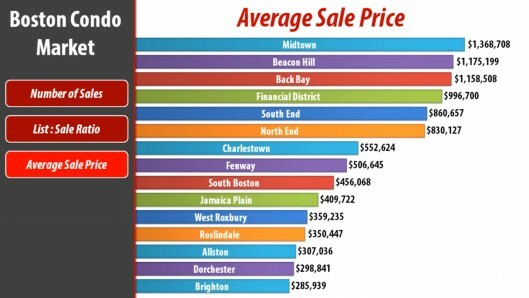 Beacon Hill and Back Bay, as always, follows suit with an average sale price of $1,175,199 and $1,158,508 respectively.Though most properties are dated with a range of 50 to 3 years old, these areas' prime location makes good for investment as well as residential buyouts. Closing the Top 5 for the highest average sale price are condominiums in the Financial District and the South End, with both having been sold below the million dollar mark, specifically $996,700 and $860,657. The units that were considered were a mix of one to three bedroom cuts, aggregated. Now to the more important figure: the list and sale price ratio. These figures indicate where properties sell above asking price and how much over or under they are from the seller's initial asking price tag. 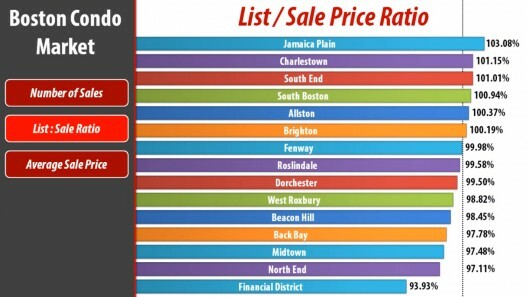 Jamaica Plain delivers the most above asking sales with more than 103% of listings being bought past the properties' asking. Surprising at second, Charlestown has also sold majority of its listings slightly over the asking price. Rounding up the top five whose listings went above asking are condominiums in the South End, South Boston, and Allston comes in tied at fifth place with Brighton. Losing out on a premium price tag is the Financial District, with condominiums having a lower leverage in terms of fetching above asking price but still well within market range. Sales of previously owned homes in the U.S. climbed in May to the highest level in more than three years and manufacturing improved in June, confirming out the Fed's view that risks to the expansion are abating. Nationally, purchases of existing homes rose over 4 percent, the most since November 2009. Attributed to the growing demand and lack of supply propelled the median home prices across the country, leading the real estate industry to forecast heftier gains throughout the summer selling season. Locally, the Northeast was second to contribute to the rise in the number of existing home sales, following only the Midwest. Regionally, Massachusetts saw a tremendous turnover of existing homes, selling more than 68% of its current inventory in just a span of one month. These properties were mostly located outside of the city, but still belonging to the Greater Boston area. Another significant area the contributed was the North Shore, whose existing home sales went through the roof in May, disposing of 87% of its inventory. The Bay State also posted record highs in terms of foreclosure transactions. More specifically, the number of Bay State homeowners facing foreclosure fell dramatically in May to their lowest level since the collapse of the real estate market in 2005. Only a total of 248 foreclosure petitions, were filed last month compared to 1,779 filed last May, an 86 percent decrease. Through May of this year, 2,698 petitions to foreclose have been filed statewide, down 66 percent from 7,877 during the same period in 2012. These numbers strongly indicate that the foreclosure crisis is finally coming to a close, and is surely becoming a non-determinant factor in the real estate market. Stalled for nearly six years, the plan to redevelop the Copley Place is back on the drawing board. The 569-foot residential and retail tower is back in play, with the goal to complete the construction of the stalled structure in the next four years. Once completed, the 52-story tower will have 109 condominium units and 433 apartments. The plan also includes an additional 60,000 square feet of retail and restaurant space. The yet-to-be-named project (assuming it won't take on the Copley Place name), will be one of the tallest towers in the city, having spectacular views of the Boston and Cambridge skyline. Simon Properties will be on the forefront of updating anxious and perspective clients of when construction will begin, and once the BCDA finally approves its proposed schematics.